I've excerpted what I believe to be representative portions of each court document released today, Thursday. I'll eventually return to this post and provide context for each filing. Contestee Al Franken respectfully moves this Court for an order in limine excluding catchall "certifications" sought from dozens of counties in a last-minute effort to force overburdened counties across the state to undertake investigations, express opinions, and create documents which are then to be "certified" and admitted into evidence before this Court. With all due respect, all such "certifications" should be rejected by this Court. First, as many of the counties have themselves noted, nothing in the Minnesota Data Practices Act requires a governmental entity to undertake investigations, to express opinions or to create documents where none existed before. Second, even if Minnesota counties and cities could be forced through a simple Data Practices Act (or even a subpoena) to create such material, it is plainly inadmissible hearsay. Such documents fall neither within the exception created by Minnesota Evidence Rule 803(6) (business records) or 803(8) (public records and reports) because such "certifications" are neither created in the normal course of business, nor do they constitute a "public record or report" within the meaning of the rule. Third, and perhaps most importantly, allowing Contestants to introduce essential elements oftheir case through this device would utterly deprive Contestee of the opportunity to cross examine these witnesses on the foundation for their "certification" of these facts, opinions, and conclusory statements and would deprive this Court of an appropriate record to evaluate the proffered statements. The hearsay rule was designed precisely to avoid that result. For all three reasons, Contestee respectfully requests an order excluding all such "certifications" from evidence. This evidence should be excluded for three reasons. First, nothing in the Minnesota Data Practices Act requires a governmental entity to undertake investigations, to express opinions or to create documents where none existed before. Second, even if Minnesota counties and cities could be forced to create such material, it is inadmissible hearsay for which no exception applies. Third, allowing Contestants to introduce essential elements of their case through this device would deprive Contestee of the opportunity to cross examine these witnesses on the foundation for their "certification" of these facts, opinions, and conclusions and would deprive this Court of an appropriate record upon which to evaluate these conclusory statements. For these reasons, Contestee respectfully submits that the requested "certifications" be excluded in favor of actual testimony of persons with knowledge, copies of the original source materials, and other relevant evidence, all subject to cross examination on the public record before this Court, on the record, and before the public. 1. Contestee's Motion in Limine is GRANTED. The information sought by Contestants does not fall within the enumerated hearsay exceptions provided by Rules 803 or 807 of the Minnesota Rules of Evidence.5 The hearsay exception applies to existing public records. Here, Contestants are asking officials to create new documents in response to their request. County and municipal officials are under no obligation to create new documents that are not already in existence and kept in the regular conduct of governmental business. Under the Minnesota Rules of Evidence and the MGDPA, Contestants would have been entitled to request existing government records that the county is under a duty to create pursuant to Rule 803(8), or in the alternative, a certification that the record does not exist pursuant to Rule 803(10). To the extent either party's requests are outside of these parameters, the Court will sustain hearsay objections. For the aforementioned reasons, the Court grants Contestee's motion in limine. Any other relief not specifically ordered herein is denied. is substantively meritless, and because the Court lacks authority to provide Contestants the relief they are suggesting, it should be denied. 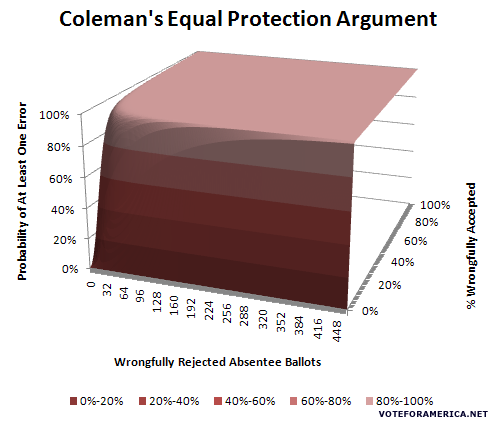 B. Contestants' Argument that the Principles of Equal Protection Require Expanding the Scope of the Recount to All 280,000 Ballots is Without Merit. For the reasons discussed above, this Court should deny Contestants' Motion for Ruling Applying February 13, 2009 Order to Previously Counted Absentee Ballots. 1. This action is necessary to correct errors and omissions made by the Respondents related to the handling of legally cast absentee ballots in the November 4, 2008 election for United States Senator from Minnesota. Respondents are charged with duties concerning the election. This Court's order is necessary to ensure that all legally cast absentee ballots are counted. 2. This Court has jurisdiction over this matter pursuant to Minn. Stat. § 2048.44. 3. Petitioners are Minnesota residents qualified as eligible voters under Minnesota election law who cast absentee ballots in the November 4, 2008 general election for United States Senator from Minnesota. Petitioners' absentee ballots were wrongfully rejected and, therefore, not counted in the final election results. Petitioners are listed by County of Residence in Exhibit A hereto. 4. Mark Ritchie is the Minnesota Secretary of State and the chief election official in Minnesota. In his capacity as the Secretary of State, Mr. Ritchie is responsible for the administration of elections in the State of Minnesota, including the November 4, 2008 general election for United States Senator from Minnesota. Mr. Ritchie is included in this action as a necessary party. 17. 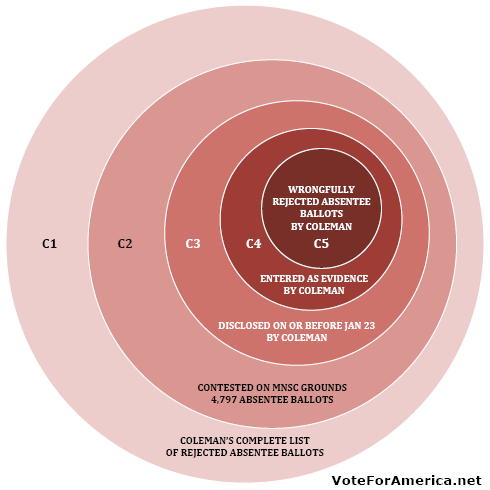 Respondents did not count Petitioners' legally cast absentee ballots in the November 4, 2008 general election for United States Senator from Minnesota, 1 Some of Petitioners' ballots were identified by the Counties as having been improperly rejected. Yet such ballots were not included in the administrative recount because they were objected to in the process established by the Minnesota Supreme Court's December 18, 2008 Order and implemented by the Secretary of State. 1. 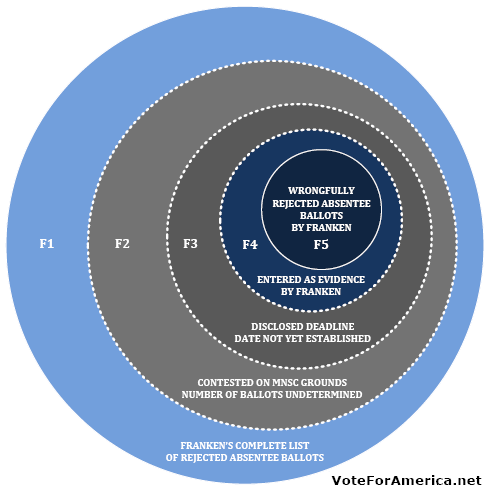 Directing that Petitioners' absentee ballots shall be opened and counted, and the total be declared and certified, for such use as might be deemed appropriate by the United States Senate or the judges responsible for the election contest pending in the District Court for the County of Ramsey, No. 62- CV -09-56 or any other proper use under law, pursuant to procedures established by this Court. 2, Granting Petitioner's such other relief as the Court deems just and appropriate. Contestants believe that the requests sent to counties and municipalities were appropriate and the responses are admissible evidence, and we are content to rely on oral argument and the authorities provided to the Court at that time. We write merely to inform the Court that if it has any hesitancy regarding the appropriateness of the requests under the Data Practices Act or the admissibility of the certifications received in response thereto, Contestants will be happy to accommodate those concerns in a fashion designed to minimize the burden on local election officials. 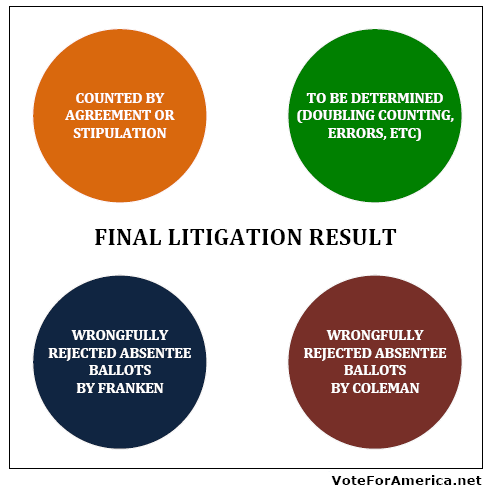 Our goal is to provide the evidence the Court requires in order to establish that the rejected absentee ballots at issue in this case are indeed legally cast votes that should be included in the Court's calculation, pursuant to Minn. Stat. ? 209.12, of which party received the highest number oflegally cast votes and is therefore entitled to receive the certificate of election. So long as Contestee would agree not to challenge foundation, which is obviously present, such an approach would provide the available evidence to the Court without having to burden local officials with having to come to S1. Paul to testify regarding matters about which there can be no reasonable dispute. Short of such an approach Contestants would have no choice but to call scores more officials to testify. For these reasons, as well as those asserted in oral argument, Contestants respectfully request that Contestee's motion be denied. We write pursuant to Gen. Rules of Practice 115.11 to request permission to file a motion asking the Court to reconsider its ruling yesterday striking the testimony ofPam Howell. The lack of bad faith or misconduct, the innocuous nature of the notes she had, the lack ofreal prejudice to Contestee, and the critical importance of her testimony to Contestants' case, together constitute compelling circumstances for the Court to reconsider its decision. The record does not reflect any evidence of bad faith or misconduct on the part of counsel. Indeed, there was no effort to hide anything and no bad faith whatsoever. The failure to produce the notes Ms. Howell provided to Mr. Haap oja was inadvertent. Neither party produced any documents at all to the other before trial. Discovery focused on responses to interrogatories; the document request which purportedly required the production of this document was an extremely broad catch-all. If the Court has any doubt about counsel's good faith, it should give us the opportunity to present evidence to satisfy any concerns. Moreover, the notes themselves are neither damaging nor inconsistent in any respect with Ms. Howell's testimony or with Contestants' disclosed theory ofthe case on this claim. The notes are simply Ms. Howell's effort to make notes to preserve her memory of the incident about which she testified. Not having the notes did not preclude Mr. Lillehaug from vigorously cross-examining Ms. Howell or otherwise unfairly prej udice Contestee. In any event, to the extent Mr. Lillehaug requires more time to review the notes and an additional opportunity to question Ms. Howell, there is no reason why she cannot be called to appear again at trial. Ms. Howell's testimony is relevant evidence that is critical to Contestants' claim regarding the double-counting of ballots in several precincts. As the Court heard, Ms. Howell testified that duplicate ballots were made and not marked as such. That fact indicates that counting the originals resulted in double-counting. The issue is a material one: all told, in the various precincts where this inadvertent mistake appears to have occurred, double-counting contributed approximately 100 additional votes to Contestee. For these reasons, we respectfully request that the Court grant Contestants the opportunity to file a motion to reconsider its ruling on this critical issue. 1. The Court's order of February 25, 2009 striking the testimony ofPamela Howell is vacated. On January 9, prior to the beginning oftrial in this election contest, Contestee served both interrogatories and document requests upon Contestants requesting disclosure ofdocuments and information relating to Contestants' claims in this proceeding. Contestant provided responses to these discovery requests on January 19. On February 3, the Court, in response to complaints from Contestee regarding the sufficiency of Contestants' responses, reminded Contestants of their continuing obligations under the Rules of Civil Procedure to provide updated answers to interrogatories and supplement them as necessary. See Minn. R Civ.P. 26.05. That same day, the Court agreed to allow Contestee to serve supplemental discovery requests upon Contestants and Contestants agreed to provide responses by February 6. On February 9, Contestee again objected to Contestants' failure to provide complete responses to discovery requests. The Court again underscored to the parties the critical importance of ensuring that discovery responses were supplemented and accurate. On February 25, 2009, during the cross-examination of Pamela Howell by Contestee, Contestee's counsel discovered for the first time that Ms. Howell had provided a document to Contestants' counsel that had never been disclosed to Contestee in response to his discovery requests. Contestants' counsel acknowledged that Contestants had received the document prior to trial but had failed to disclose it to Contestee. After hearing argument from both parties, the Court ruled from the bench striking Ms. Howell's testimony. By failing to disclose the existence of a document provided to them by the witness, Contestants have failed to comply with orders from this Court directing parties to ensure that their discovery responses are complete, accurate, and up-to-date. The Court recognizes that striking testimony is a severe sanction but notes that this trial has been underway for five weeks and that the parties have been repeatedly instructed of the need to supplement discovery responses. The Court believes this sanction was within its discretion in light of Contestants' repeated failures to adhere to their discovery obligations under the Minnesota Rules of Civil Procedure. Nonetheless, the Court recognizes that the judicial process is an attempt to seek the truth and that courts "should not unduly hamper that search by excluding relevant evidence where other means are available to protect a party from the effects ofan inadvertent failure to disclose." Comfeldt, 262 N.W.2d at 697, The Court has the discretion to exclude testimony, but "the exercise of that discretion should be tempered by an effort to seek a solution short of exclusion that will accommodate the competing interests inherent in the discovery rules and the adjudicative process itself," Id. The record reflects that Contestants' failure to disclose the document was inadvertent and not in bad faith. Contestee has now had an opportunity to review the document and prepare a proper cross-examination. Contestee will not be substantially prejudiced by permitting Ms. Howell to conclude her testimony. Accordingly, the Court now reconsiders its ruling of February 25 and vacates its order to strike Howell's testimony. Contestants hereby move to withdraw the previously filed motion seeking the admission pro hac vice of Benjamin Ginsberg. Mr. Ginsberg will not participate in the trial and no longer seeks the Court's permission to do so. Contestants accordingly request that the Court enter an Order that the record reflect the formal withdrawal of the motion. TO: AL FRANKEN AND HIS ATTORNEY RICHARD D. SNYDER, ESQ. 200 S. 6TH ST. SUITE 4000, MPLS. MN 55402. PLEASE TAKE NOTICE: The Motion of Jeffrey Cox and the city of Duluth, as more fully specified below, will be heard by the Court on February 27, 2009 at 1:00 p.m. before the presiding judge in the above referenced matter at the Minnesota Justice Center, 25 Rev.Dr, Martin Luther King Jr. Blvd., St. Paul, MN. 55155, Courtroom 300. Jeffrey Cox and the city of Duluth moves the court pursuant to Rule 45.03 (c). Minn.R.Civ.P. for an order quashing the subpoena served by Franken upon Jeffrey Cox or in the alternative, orderingFranken to reimburse Cox andthe Cityreasonable expenses in the amount of $1,151.50. The movants rely upon their Memorandum of Law and Affidavit of M. Alison Lutterman in support of their motion. Jeffrey Cox, City Clerk for the City of Duluth as been served with a subpoenaby Al Franken to testify in this matter. Mr. Cox has requested that Franken provide reasonable compensation to himas authorized by Rule 45.03(d), Minn.R.Civ.P. Because Franken has 110t agreed to provide reasonable compensation to Cox, he and his employer the city of Duluth assert this motion to quash pursuant to Rule 45.02(c), Minn.R.Civ.P. Because of the inadequate notice in advance ofthe requested time for testimony, it is impossible for Cox and the City to comply with the notice requirements ofRule 115.10, Gen.R.Prac. Therefore, they request that the Court, in the interests ofjustice, relax the notice requirements pursuant to Rule 115.07, Gen.R.Prac. Municipalities all over the state are facing a budget crisis. The city of Duluth is not exception. The City runs a leanly staffed organization that is struggling to provide to its citizens the services they have a right to expect. It should not be asked to bear the expense of providing its employees for these proceedings because it has no interest in these proceedings and is not a. party. The subpoena should be quashed, or in the alternative, Franken should be ordered to pay in advance the estimated costs for Cox's appearance.